As part of the ongoing North American Free Trade Agreement renegotiations, the Trump administration is seeking substantial changes to the treaty’s investment rules. Given President Donald Trump’s economic nationalist worldview, many of the proposals the United States has brought to the negotiation table have been met with skepticism, if not outright hostility. Yet, as the Cato Institute’s Simon Lester previously noted, “While some of the U.S. NAFTA proposals are controversial and hugely problematic, others are controversial but actually have some basis.” Rethinking NAFTA’s investment chapter actually makes a lot of sense, for all three countries. The investor-state dispute settlement (ISDS) rules included in the original NAFTA mirror similar clauses included in many trade and investment agreements. They allow foreign investors to file claims for monetary damages when alleging mistreatment by the host government. A panel of private arbitrators hears these claims, with no real opportunity for appeal; awards can range into the hundreds of millions of dollars. In recent years, companies have used NAFTA’s investment rules to challenge government decisions to regulate chemical additives and hazardous waste, deny mining licenses, and limit fracking for natural gas. The Trump administration’s top trade negotiator, Robert Lighthizer, argues these rules infringe on American sovereignty by superseding domestic judicial processes. Though there is increasing agreement that ISDS needs significant reforms, consensus on what those reforms should be remains elusive. This debate is playing out in the ongoing NAFTA renegotiations. Based on media reports, the U.S. has staked out a conflicting and ultimately incoherent position on the new investment rules. On the one hand, American negotiators do not want to see U.S. laws and regulatory processes subjected to judgment by a private international arbitration system. On the other, under pressure from the strong lobbying power of the U.S. Chamber of Commerce, the U.S. wants American companies to maintain their current rights under NAFTA to bring cases against Mexico and Canada. To achieve both these goals, the U.S. has requested that an “opt out” clause be included in NAFTA’s investment chapter. While it is difficult to assess this idea in the absence of any formal, published proposal, reports suggest that the U.S. hopes to opt out while Mexico and Canada would not. This would allow American companies to file claims against the Mexican and Canadian governments, while Mexican or Canadian companies could not file claims against the U.S. government. Mexico and Canada are, quite rightfully, pushing back on this idea. Whether or not the Mexican and Canadian governments buy in to American arguments about ISDS infringing on sovereignty, it is unreasonable to expect them to agree to a set of obligations that are not also binding on the U.S. And given that the Trump administration has made “reciprocity” the rhetorical centerpiece of its new trade policy, it is a bit ridiculous for the U.S. to adamantly defend such a one-sided proposal. In light of the current impasse, there is a real possibility that NAFTA’s investment rules will be scrapped in a NAFTA 2.0. This could happen either by the parties formally agreeing to exclude ISDS altogether, or by including an opt-out clause, which all countries, not just the U.S., would exercise. In either case, NAFTA’s ISDS rules would no longer apply. For Mexico, which has benefited significantly from attracting foreign investment under NAFTA, the prospect of eliminating these investment rules may seem daunting. After all, the stock of American foreign investment in Mexico has increased more than three-fold (in inflation-adjusted terms) in the years since NAFTA was signed. This investment has had significant positive spillovers for Mexico’s broader economy, helping to create jobs and boost productivity. Yet there is little reason to believe that doing away with ISDS in NAFTA would necessarily lead to substantially less foreign investment in Mexico. 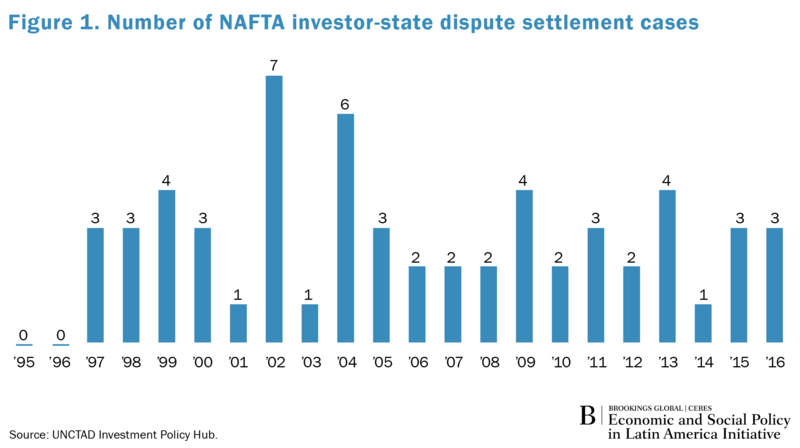 NAFTA did have a positive impact on foreign direct investment (FDI) into Mexico, but this was driven more by the treaty’s trade provisions than its investment rules per se. By improving market access for exports to the U.S., NAFTA made Mexico a more attractive FDI destination for firms participating in networked regional value chains. In general, there is scant academic evidence that ISDS causes greater FDI flows, or that the two are causally related (see Figure 1); a country’s overall investment climate, natural resource abundance, quality of the workforce, and domestic market opportunities are far more important determinants of FDI than investors’ access to ISDS. Moreover, even if investors lose access to ISDS under NAFTA, there is a lot that Mexico can do to further welcome and reassure foreign investors. This starts with domestic reforms to strengthen the investment climate, for instance by streamlining licensing and permitting processes and cutting down on crime and corruption. Mexico also recently signed the International Center for Settlement of Investment Disputes convention, having previously been one of the largest holdouts, and—along with Canada—joined the revised Trans Pacific Partnership, which includes investor protections. In short, Mexico can take many actions to demonstrate to any skittish investors that the government has no interest in turning its back on foreign investment. Ultimately, it is still too soon to tell how the NAFTA investment negotiations will play out. The business lobby in the U.S. may ultimately win the domestic argument, convincing American negotiators to push for preserving traditional ISDS. (If this is the case, Mexico and Canada will need to decide if they are happy with ISDS as it is, or want to push for some progressive reforms to the system.) But if the U.S. maintains a hard stance on ISDS, insisting that it wants to opt out of the system, Mexico and Canada should be prepared to leave ISDS out of the new NAFTA. This would be a “concession” to American demands that would bring only small and manageable costs. If getting rid of ISDS makes it easier to achieve a NAFTA deal that the Trump administration can live with, Mexico and Canada should be happy to go along.